Powers/Abilities: The Shadowqueen has great magical powers, the majority of which are derived from the N'Garai. She can view events across a physical distance or across dimensional barriers, fire energy bolts, project magical shields, and call on various magical entities (such as the Faltine) for power. She can transform others into stone gargoyles serving her will, and these gargoyles transform others upon contact. She is resistant to aging and showed no changes over 1000 years. (Dr. Strange II#43 (fb)) - One thousand years ago, Princess Shialmar was part of an effort alongside her brother Jehan and her court magician Vung, seeking to overthrow the tyranny of the Wizard Kings of their realm. To this end, they summoned Kan, a Tibetan monk and warrior, to their realm via the Black Mirror, requesting his aid in their coup. (Dr. Strange II#44 (fb)) - Kan was initially reluctant to lead a war, but Vung secretly summoned a demon, a Kyrii, to attack Shialmar, framing the Wizard Kings for the assault. Saving Shialmar, Kan agreed to lead the army, falling in love with Shialmar in the process. (Dr. Strange II#44 (fb)) - Kan led the army to overthrow and slaughter the Wizard Kings, after which Vung betrayed him, imprisoning he, Shialmar, and Jehan, as he sought to seize power for himself. However, when Vung summoned his masters, the N'Garai, to sacrifice the others for power, Shialmar called out, offering her own soul to the N'Garai if they gave her power instead. Transformed by the N'Garai into the Shadowqueen, Shialmar slew Vung, after which she had to choose the life and soul of one she loved to surrender to the N'Garai. The Shadowqueen slew her brother Jehan for the N'Garai, and she sent Kan back to Earth. (Dr. Strange II#44 (fb) - BTS) - The Shadowqueen ruled without challenge for one thousand years until Bayan/Silver Fox, last descendent of the Wizard Kings began to lead a rebellion against her. (Dr. Strange II#42 (fb)) - The Shadowqueen sent the Lords of the Golden Dragon to capture Wong. (Dr. Strange II#38 - BTS) - Wong was duped by an old ally Sung and captured by his agents Han and Deng. (Dr. Strange II#39 - BTS) - Clea followed Wong's trail to Sung, who denied knowledge of his whereabouts. Realizing that Clea suspected the truth, Sung sent Han and Deng, as well as some of "Dormammu's wraiths" after her (the wraiths might have been sent by Baron Mordo, as there were a few plots going on simultaneously). 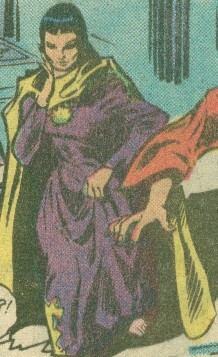 Fleeing, Clea magically divined Wong's presence as Sung's prisoner, then she switched forms with Sara Wolfe, enabling her to escape the wraith's detection. (Dr. Strange II#40 - BTS) - Agents of the Lords of the Golden Dragon shot and captured Clea when she approached their mansion base in the Adirondack forest. Sara Wolfe informed Strange about Clea's absence. (Dr. Strange II#43 (fb) - BTS) - Clea and Wong were sent through the Black Mirror to the Realm of the Shadowqueen. Rebel forces freed Clea, but then the Shadowqueen's Sky-Slayers attacked, capturing Wong and taking him back to the Shadowqueen's fortress. (Dr. Strange II#42 - BTS) - Strange followed Clea's trail to the Adirondack mansion, but a pair of agents of the Lords, Chou and Mung, ran Strange's car off the road. Strange, having levitated to safety attacked the pair, defeating them in spite of the magical power granted to them by the Lords. As Strange approached the mansion, the Lord conjured an immense dragon to attack him. 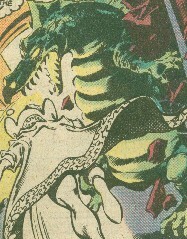 Unable to defeat the dragon, Strange sent his Cloak to smother one of the Lords, disrupting their circle of power, causing the dragon to fade from existence. Strange then mystically bound the Lords and used their Black Mirror to travel to the Realm of the Shadowqueen, where he was beset by rebels who mistook him for an agent of the Shadowqueen. (Dr. 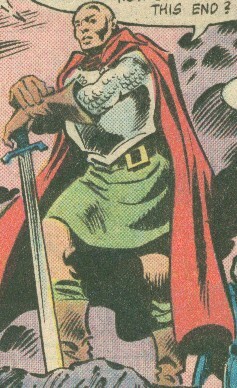 Strange II#43) - Strange formed an alliance with the rebels, led by Bayan. Meanwhile, the Shadowqueen summoned the Lords of the Golden Dragon back to Majaedong, transforming them into stone gargoyle/dragons as punishment them for their allowing the involvement of Dr. Strange in the conflict. Strange and his allies entered Majaedong, where they were ambushed by the stone gargoyles, whom they held off long enough to flee the city. Later, the Shadowqueen, via a magical viewing crystal, watched the rebels telling Strange of her origins. (Dr. 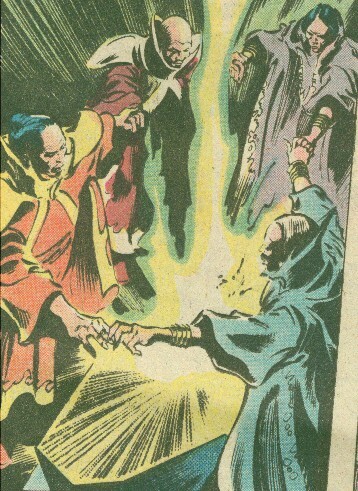 Strange II#44) - As Wong finished relating the story of the Shadowqueen, she appeared and attacked the rebels directly. Slaying one of the rebel officers, the Shadowqueen transformed his body into another monstrous stone gargoyle, which transformed each person it touched into another gargoyle, serving the Shadowqueen. Dr. Strange and the Shadowqueen fought one another directly, and Strange began to fall before her onslaught. 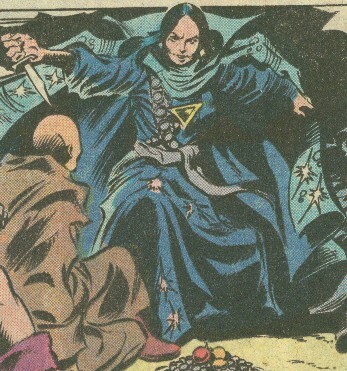 Wong then shot the Shadowqueen with an arrow, wounding and distracting her, enabling Strange to exorcise her evil (via a spell invoking the Tetragramaton), and pulling it into himself. 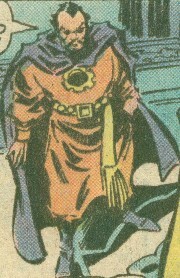 Clea then turned the Eye of Agamotto on Strange, purging him of the evil as well. Though free from the N'Garai's evil influence, Shialmar had become such a part of that evil that its removal proved fatal to her. She repented as she died, her dazed vision seeing Wong as Kan, whom she asked for a kiss before dying. Comments: Created by Chris Claremont, Gene Colan, and Dan Green. Realm of the Shadowqueen...c'mon, how about a name? Howabout Xot? Why not?!! No one would have called it the Realm of the Shadowqueen before Shialmar's transformation, and it's unlikely they would still use that name after her death. This story is an excellent example of Claremont's use of the term "Elder Gods" meaning the N'Garai, as he uses both terms in this story. What's up with Claremont and putting apostrophes in the middle of names? Maybe he's Wakandan? Shadowqueen has an entry in Mystic Arcana: The Book of Marvel Magic. There her home dimension was revealed as Kaichek. Kyrie - Menagerie, possessed Shawna Lynde. 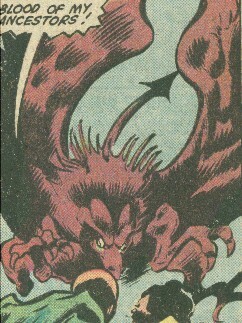 Golden Dragon - thought to be a thing of worth, sought by Kwai + Cho Lee + Shadow Thief + Stern + Shareen + Shang-Chi + Jenny Quinn + Black Jack Tarr + others, contained only a message: "Without pursuit, life is meaningless and hollow"
other "Lords," "Golden," or "Dragon" characters, groups, etc. Living beings transformed into stone gargoyles by her power, they serve her will, and can transform others into similar stone gargoyles upon contact. 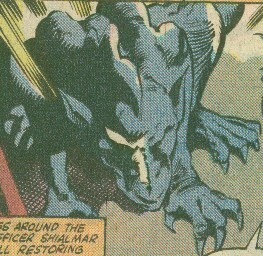 The Lords of the Golden Dragon were turned into such gargoyles after they allowed Dr. Strange access to the realm of the Shadowqueen. An ancient Chinese monk, he is the ancestor (and virtual look-alike) of Dr. 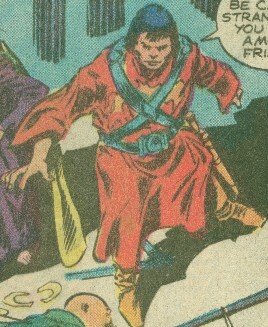 Strange's ally, Wong, and was a student of the occult, seeking alongside his brothers to comprehend the secrets of the world. He was a mystic, a teacher, a healer, and, when necessary, he was a warrior. Investigating a light in a reputedly "haunted temple," Kan entered it, encountering the Black Mirror, through which he was transported to the Realm of the Shadowqueenby Jehan, Shialmar, and Vung to lead their armies against the tyrannical Wizard Kings. Initially resistant, he was duped into agreeing by a Vung, and he fell in love with Shialmar. After his success, he was betrayed by Vung, and he watched helplessly as Shialmar surrendered her soul to the N'Garai to stop Vung. The Shadowqueen spared his life and sent him back to China, where he kept the Black Mirror with him always, making certain that the dimensional gateway was never opened again. He once more became a priest chose to make atonement by indenturing himself to a mage who served the forces of good. His first-born son, and each of his descendant's first-born followed in his footsteps, continuing over ten generations, including Hamir, who served the Ancient One, and Wong, who worked with Dr. Strange. Demonic beings, one was summoned by Vung to frame the Wizard Kings in an assault on Shialmar, gaining Kan's sympathy and support. He had a variety of magical powers, including manipulation of earth. One thousand years ago, he was court magician to Princess Shialmar, and he allied himself with Shialmar and Jehan in the plot to overthrow the Wizard Kings. However, he secretly served the N'Garai and pursued the alliance to eliminate the Wizard Kings as rivals with the intent to seize power for himself. It was he who cast the spell that brought Kan to their realm. When Kan doubted leading the war against the Wizard Kings, Vung conjured a Kyrii and sent it after Shialmar, framing the Wizard Kings for the assault. After the Wizard Kings were defeated, Vung attempted to sacrifice his former allies to the N'Garai for power, but Shialmar usurped that power, slaying Vung after she had become the Shadowqueen.